Manchester United manager Jose Mourinho is reportedly at odds with Ed Woodward and the club in general again over January transfer window targets. In a worrying development, it looks as though all is not well inside Old Trafford despite some recent improvement in performances and results. 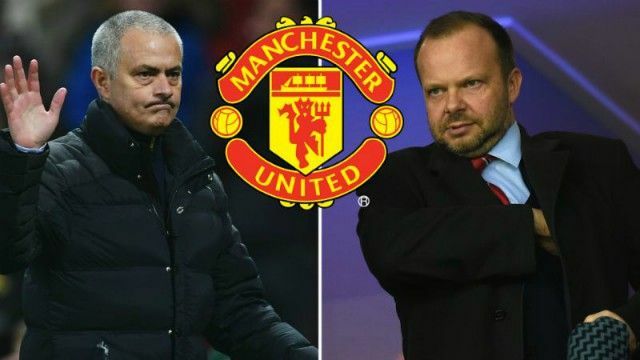 Two separate reports today suggest Mourinho and Woodward have some differing views over who could be signed in the winter, and suggest a compromise could be hard to come by. The Metro claim Mourinho and Woodward will finally meet after an initial meeting was cancelled, and that the Portuguese tactician has been left unimpressed by defensive targets put forward by the club’s scouting team. ESPN, meanwhile, claim United chiefs could veto Mourinho’s preferred targets once again after also failing to agree on players in the summer. MUFC fans will not be happy to learn of such disharmony behind the scenes, with the club needing to agree on a common direction if they are to get back to their glory years of the Sir Alex Ferguson era. And as CaughtOffside told you yesterday, club chiefs are also paralysed over what move to take next regarding the possible appointment of a new manager, with huge varying views within the boardroom. As they’ve often looked on the pitch this season, it seems things truly are a mess at United at every level right now.